Pre-17 driving scheme launches second Cardiff site due to demand! 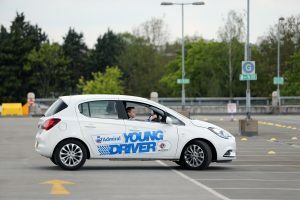 A groundbreaking driver training course aimed at 10-17 year olds has announced it will launch a second venue in Cardiff, due to a surge in demand. Having launched at St David’s Shopping Centre in 2012, the Young Driver scheme will now also run monthly at the Cardiff East Park and Ride site. The first Admiral Young Driver event will be held at the Park and Ride on Saturday 5th August on a specially designed course within the centre’s car park, offering anyone over the age of 10 the chance to drive a car in a safe but realistic environment. Dates are confirmed through until the end of the year. Four hundred people are killed in accidents involving young drivers every year in the UK. Shockingly, one in five newly qualified drivers crash within six months of passing their test, rising to 40 per cent of 17-year old males. Only eight per cent of drivers are aged 17 – 24 and yet they account for a worrying 30 per cent of people who are killed in cars every year. But for those who have taken a Young Driver course, the rate of accidents in that worrying first six months drops by more than a half, to fewer than one in ten. The scheme has now given more than 450,000 lessons at over 45 venues across Britain. During the lessons brand new, dual controlled Vauxhall Corsas are used and tuition is provided by highly qualified driving instructors. On a specially constructed road system with traffic signs, and specific areas for practising manoeuvres, youngsters are encouraged to consider responsible driving and are given time to perfect the necessary driving skills without the pressures of public roads. A personalised Drive Diary charts how they do. Kim Stanton from Young Driver said: “We are absolutely delighted to be launching at Cardiff East Park and Ride. We have been looking for a second venue around the Cardiff area for some time as our St David’s venue was always fully booked, and we hate having to turn people away. The park and ride is fantastic, and will complement what we offer at St David’s perfectly. It’s a huge site, so we’ll be able to set up a really interesting course for keen young learners, and give them the opportunity to try out lots of different driving skills and techniques. Driving tuition is available for disabled youngsters and Young Driver can also cater for birthday parties. Thirty or sixty minute lessons must be booked in advance. Lessons start from £34.95. Young Driver will initially run approximately once a month at the centre, with confirmed dates so far on 5th August, 10th September, 1st October, 12th November and 17th December. For more information, to book a lesson or to buy vouchers visit www.youngdriver.com or call 0844 371 9010.